I have a habit that might not be entirely healthy. 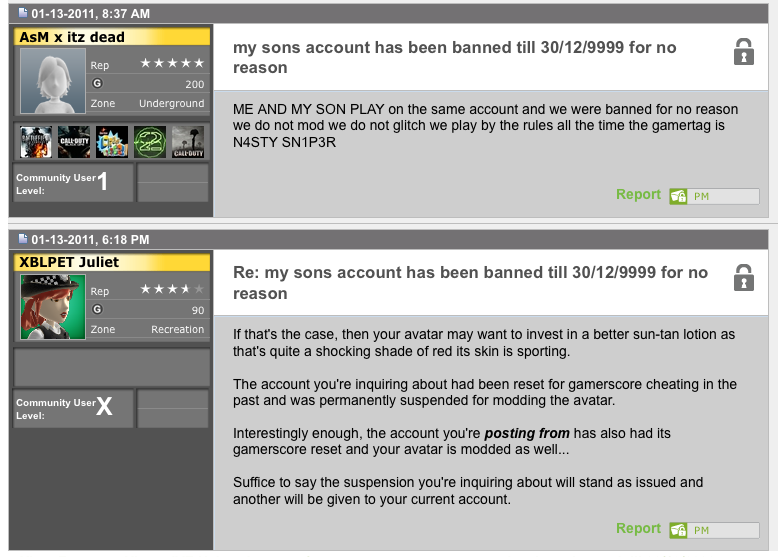 In short, if I feel like I need a quick pick-me-up, I go for a brisk wallow in the mud-pit of human suffering that is the Xbox Live Account Suspensions and Console Bans forum. Much like tvtropes; you start reading it and then you just keep reading and all of a sudden it’s 3 AM. Here’s a few particularly enjoyable bits selected from today’s postings. I like this one a lot because the guy is trying really really hard to be helpful at the end. And of course, appealing to a higher authority is always a good tactic. I am really upset how your system works. Your company is corrupt. You made me waste $25 on a 3 month card for an account that is now permanently suspended and you also stole a lot of downloadable content that I can no longer use on my account since you suspended it. My parents are also upset that you are not allowing this to be lifted when I didn’t break any rules whatsoever. I am in a MLG group and a machinima and now I can’t participate in them cuz of you. This is really unacceptable. I did nothing wrong of the sorts and you really must stop deleting people’s posts. Have you even heard of the 1st amendement??? IT’S CALLED FREEDOM OF SPEECH. I would like to speak to whoever is in charge because my parents are not happy one bit at you guys. I acknowledge that reading this sort of thing for amusement makes me a terrible terrible person. Edit: while most of the time, the response from Microsoft representatives is a dry “you were banned for violating the code of conduct”, occasionally a rep will let their snarky side show. Here’s one I thought deserved preserving for posterity.